Resources on sustainable retrofitting tend be brainstormers or how-tos with a focus on design, construction or behaviour modification. For instance, yourhome.gov.au lists ‘six ways to minimise water use’ and discusses rain tank considerations. Mobbs’ book is more of a how-to on getting around bureaucratic naysayers. When told that inner Sydney rainwater was unsafe to drink, he took his own samples every fortnight, over eighteen months, and had them tested at a laboratory. Mobbs not only writes about his experience of renovating and living in a sustainable home, he also has released concrete data such as costings and savings. Sustainable House is anecdotal and Mobbs’ findings needs to be replicated in a proper study to become universally accepted evidence. Nevertheless, it’s definitely worth a read if architects, builders, and local councils are giving you grief over wanting to adopt certain frontier technologies in your renovation/build. 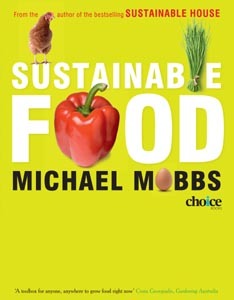 In 2012, Mobbs published Sustainable Food, which focuses on how individuals can address future food security. 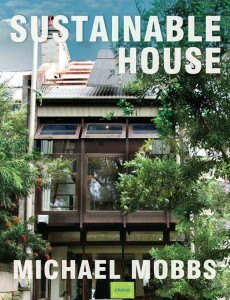 Like in Sustainable House, Mobbs focuses on highlighting and circumventing bureaucratic hurdles. There’s a lot on guerrilla gardening, where communities have gone out and improved their neighbourhoods before seeking approval. In Wilga Ave, Dulwich Hill, locals self-installed gardens into their five-metre wide concrete footpaths after failing to get a response from their council. Some gardeners avoid dealing with local government altogether. They collect food waste from local businesses for composting or turn vacant blocks into productive spaces. If gardening is not an option, Mobbs suggests setting up food boxes amongst like-minded folk, so that you can buy direct from local farmers and circumvent supermarket food miles. Since many of Mobbs’ suggestions clash with the establishment, Sustainable Food, like Sustainable House, also considers the safety concerns surrounding certain practices. For instance, it is safe to use treated pine in kitchen garden planter boxes**. It is safe to eat food grown on the verge***. Mobbs’ arguments ring out sermon-like every so often; there’s too much of a David and Goliath narrative; you really have to be one of the converted to agree with what he is saying. But the evidence behind the claims, in the form of expert opinion, studies, and anecdotes, is certainly sustainable food for thought. Especially when it’s borrowed from the local library. * If you’re in Sydney, check out Michael Mobbs’ house. He does tours every so often. ** ‘There is clear evidence that arsenic levels accumulate with time in the soil, but bioavailability remains low’ (Phil Mulvey of Environmental Earth Sciences, quoted by Mobbs). *** ‘…as recommended by the Department of Health all food for consumption should be washed prior to consumption. If this simple common procedure is undertaken health impacts from food grown on roadside verges and other simple public land is not expected to cause any health issues’ (Phil Mulvey of Environmental Earth Sciences, quoted by Mobbs).